There are nearly 20 a cappella groups at Yale University. With his strong musical background at Staples High School, Nick Massoud could have auditioned for any. But he was drawn to the Spizzwinks. The group offered something unique: During each member’s 3 years, they tour all 6 inhabited continents. And they perform in each member’s hometown. Music was always part of Massoud’s life. He played in Betsy Tucker’s Long Lots steel band. He sang in musicals at Bedford Middle School, and with Staples Players. Orphenians — the high school’s elite singing group — became his family. Two years ago, director Luke Rosenberg’s group was invited to San Francisco. They sang at Chanticleer’s National Choral Festival. As they drove around the city and out to the redwood forest, they kept singing. Massoud — who was also involved in Wreckers InTune, the debate team and JSA, and served as president of Top Hat Tutors — realized he could not give up music in college. Spizzwinks are no part-time commitment. Last year they performed 97 concerts, at schools, nursing homes, churches and clubs. The non-profit choir is entirely student run. Members plan international tours, raise money, and handle logistics. 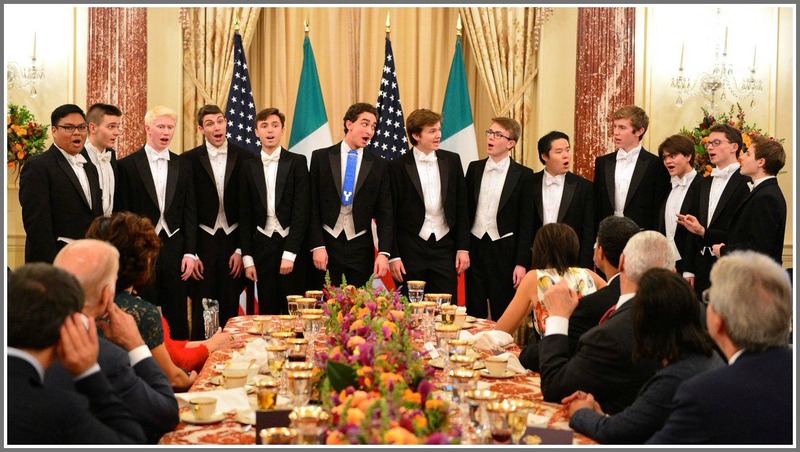 The Spizzwinks sing for Joe Biden and John Kerry. Nick Massoud is in the center — wearing a blue Yale tie. 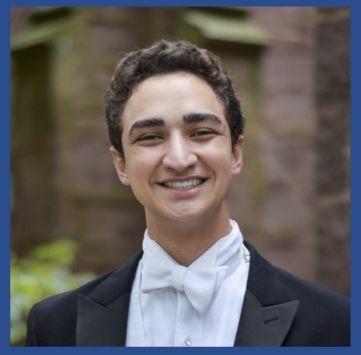 “I saw an opportunity to use a lot of the skills I picked up running Top Hat, in a musical setting to facilitate 2 things I love: traveling, and singing with friends,” Massoud says. Now, as a junior majoring in global affairs — with a concentration in international development — he is the group’s business manager. He’s performed with them in China, Europe, New Zealand, Indonesia, Iowa, Hawaii and Alaska. They’ve sung for Joe Biden, John Kerry, the Italian prime minister, China’s vice premier, Lady Gaga and Melania Trump. 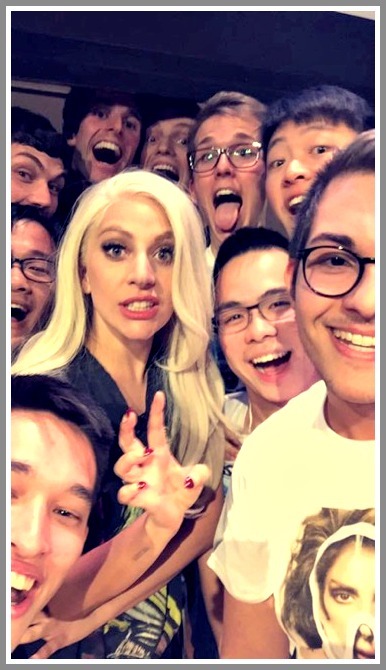 The Spizzwinks and Lady Gaga snap a selfie. This year they’re scheduled for Morocco, Chile, Argentina and South Africa. 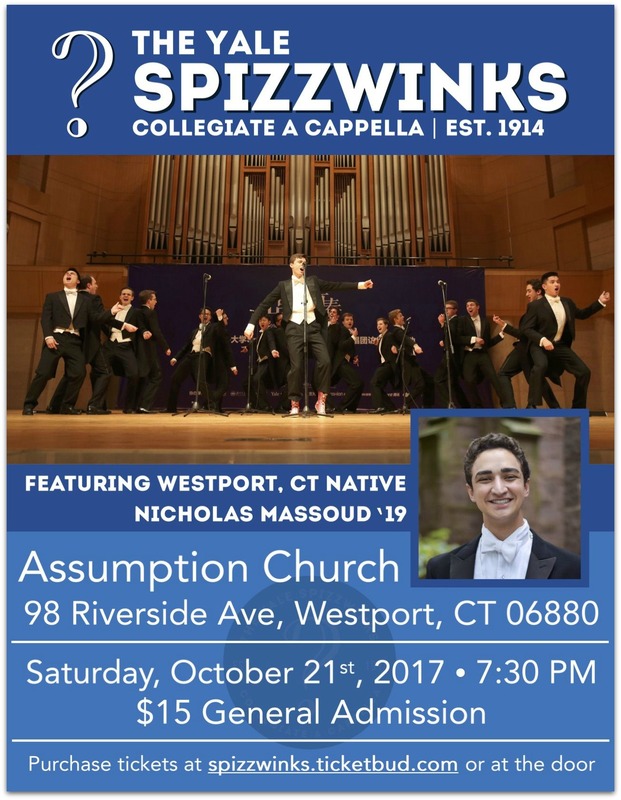 This month, he brings the Spizzwinks to Westport. Sure, every member hosts the group at some point. But Massoud thinks the concerts in his home town are special. “Having met so many people in college, I realize that growing up in a place that supports the arts so significantly is rare,” he says. The Westport schedule is packed. There’s an evening concert at Assumption Church (details in the poster above), a performance and master class at Bedford, and a session with the Staples choir. That does not allow much time for Massoud to show off Westport. However, he will make sure to take the Spizzwinks to Sherwood Diner. That’s where he and his fellow Players headed after every show — often in full makeup. Massoud has traveled the globe with his group. However, he says, “bringing the Spizzwinks to my home, and showing them my community, feels like the most important thing I’ve done with them. This entry was posted in Arts, Education, Organizations, Staples HS and tagged Luke Rosenberg, Nick Massoud, Staples Orphenians, Staples Players, the Spizzwinks, Yale University. Bookmark the permalink. Rodger and I plan to attend the concert at Assumption Church. Do we need tickets? If yes, how do we buy them? What time? Tickets are $15. They’re available at http://www.spizzwinks.ticketbud.com, or at the door. Outstanding. Looking forward to it. As a former Whiffenpoof (and Orphenian) and proud member of the Whiffenpoof Alumni, I have been honored to sing with many a Spizzwink. I am certain that this will be a great show. Enjoy!